DECATHLON COACH - HOW DOES IT WORK? We have created the DECATHLON COACH web site and application to help you reach your target, no matter what your level. Whether you want to start running or walking, tone, lose weight prepare for a race or simply train more frequently. With DECATHLON COACH, you will be able to monitor how regularly you train every week or month, monitor your changes in weight and muscle mass, access our advice on how to progress or even follow a free training programme created by professional coaches. We work every day to increase your enjoyment of your activity and help you improve your fitness through sport. The DECATHLON COACH website enables a more detailed analysis of your activity and monitor how regularly you train and your progress. To do this, the first step is to measure each of your sporting sessions. If you are using the DECATHLON COACH application to record your sport sessions, the sessions will automatically be added to your history (more details on the application). If you use an 120 or 220 ONmove GPS watch, you can transfer your sessions thanks to the mobile application myGeonaute connect or the ONconnect software for PC/MAC. Your sessions will be added automatically to your history. If you do not train with our application or one of our GPS watches, you can also add a session manually by entering the distance covered, the duration of the activity, etc. On the decathloncoach.com website homepage, click on the orange button "Add a session". On the website homepage, you will also be able to view your sporting activity. Each session is also represented by a sticker. You can also view the change in your weight each time you enter it. At the end of each month, a special sticker informs you of the "quantity" of sport that you have done, compared to the previous month. Gradually, we will create new stickers to offer advice suited to your sporting activity. Click on a session sticker to access the details. You will be able to analyse it in detail. By checking out the route, you will be able to view your average speed, distance covered and time spent on the activity. You will see the percentage of gradient at each point on the route. Thanks to the "Sections" tool, you can even select a section of your session to analyse your average speed on that section. It is not always easy to keep motivated all year round. To support you, we have created a view that summarises the distance covered each month of the year. Go to the "My monitoring" tab, the default view represents the number of kilometres that you have covered each month of the current year. 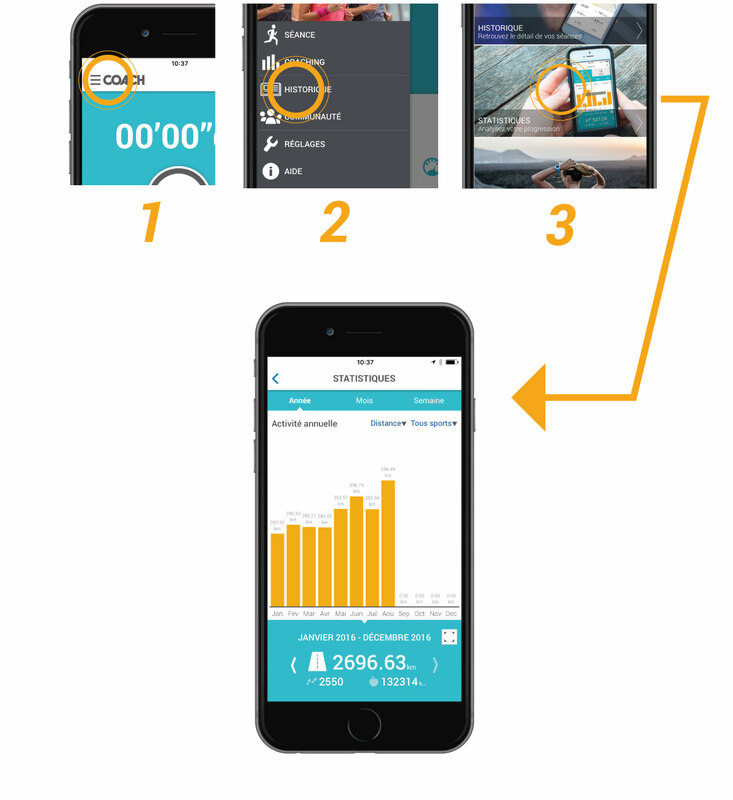 You can select another value than distance (calories burned, activity duration, etc). Enjoying sports also means being interested in your body. This is why DECATHLON COACH enables you to monitor changes in your physiological parameters. In the "My monitoring" tab again, in the "Weight" sub-tab, you can manually enter your weight and if your scales measure them, your body fat and muscle mass. If you have a GEONAUTE Scale 700 scale, synchronise it after each weigh-in thanks to the myGeonaute connect mobile application. Your weight appears automatically on the "Weight" page on decathloncoach.com. Measuring and monitoring your regularity is very good. However, to progress, we all need advice. The "Advice" page provides tips on how to use the website and application, as well as all our sporting expert's knowledge to progress in walking and running. On the community page, invite your friends to join you on Decathlon Coach and compare your performances! On the application homepage, the central "Play" button enables you to start recording the session. The application will then use the GPS on your telephone to measure your movements and calculate your distance and average speed, in real time. At an interval of your choice, 500m, 1km, 10 minutes etc, a voice will state your chosen parameters: distance, average speed, real speed, calories burned, vertical distance, pace, etc. If you have a cardio bluetooth 4.0 device, the application will tell you in which effort zone you are (warming up, endurance, resistance, etc), to help you find the right pace, YOUR pace. At the end of your session, click on the "Pause" then "Stop" button. The session will record on your account and the application displays the summary of your session. You can find your session instantly on the website decathloncoach.com. 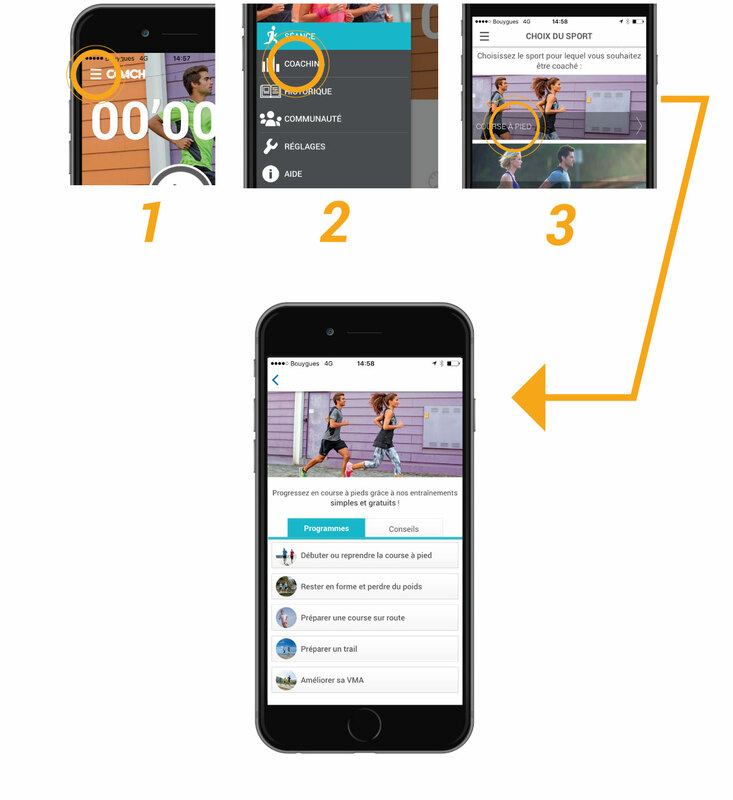 In the "Coaching" section of the application's main menu, you can find all our training programmes for walking and running. We provide plans to start sport (for example managing to run 20 minutes without stopping), to help you lose a few pounds and training programmes to progress or prepare for a race (whether it is your first 10km or 3rd marathon). Our coaches have developed sessions and exercises over several weeks, often based on the interval training principle (mix of intense effort followed by more moderate effort) to help you progress. Once the programme chosen and planned, click on it to start it. The coach will support you via your earphones during your session (check that the telephone sound is loud enough). In the "History" section of the application's main menu, you will find the details of all your sessions and your monitoring graph like on the decathloncoach.com website. You can also view the changes in your weight, and can add a manual weigh-in. The ONmove 220 GPS watch is designed for DECATHLON COACH users who wish to exercise without their telephone and/or who want to view their instant and average distance and speed, in glance on their wrist. It is designed for running, trail running, cycling and walking. 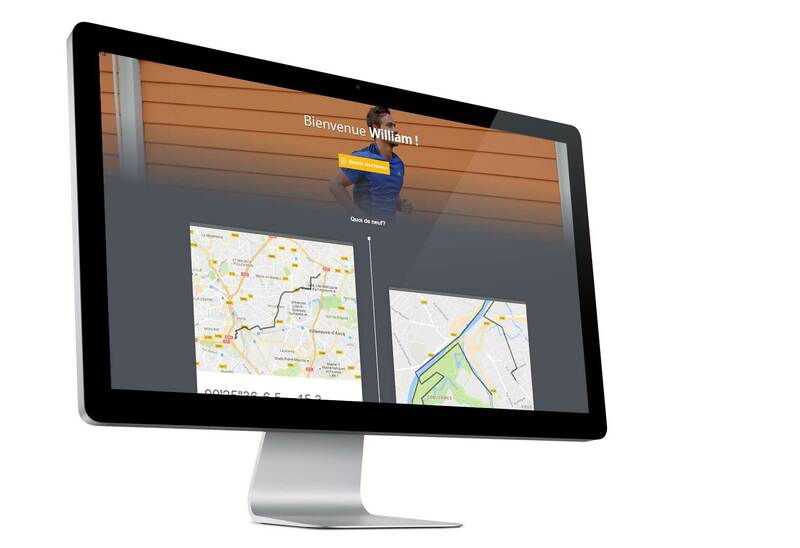 You can therefore use it at the same time or instead of the DECATHLON COACH application and when back home, you can consult the details of your sessions on the DECATHLON COACH application and the decathloncoach.com by bluetooth (myGeonaute connect) or USB (ONconnect software).